On second thoughts, the extra Zzz's, in the title, finally begin to make sense. Okay, so we all know what Subhash Ghai's Karz is all about, don't we? 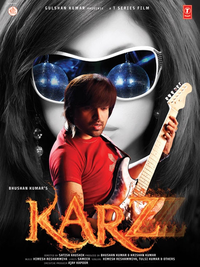 So, it’s not exactly your Farzzz to see Karzzz. The outcome’s neither good, nor bad, it’s a pitch at wooing the box-office, from A to Zzzz. And from advance reports, is already on its way to do the click trick. Go for it only if Himesh Reshammiya singing, dancing and acting makes up for your paisa and time vasool. While not objectionably bad, Karzzzz is a completely unnecessary production, and all it can justify is the Zs in the title. If you are looking for pure masala with no pretensions of brainy-brawny stuff then go for this film. You could get your paisa vasool. I won't waste our time by delving into the highly predictable story, it is heavily based on Ghai's Karz with a few changes in the latter portions. It's suffice to know that the film deals with reincarnation and revenge in the most amateurish of ways. Karz: The Burden Of Truth could have been titled "The Burden" instead. History repeated with finesse, can be watched once. The movie is not boring and even though one knows the story and the end is somewhat predictable there is an element of suspense. Himesh is quite alright in the film although if you don't like him it's best to stay away.